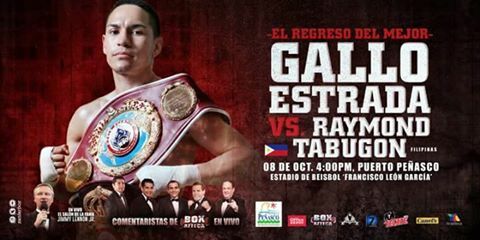 Former WBA and WBO world flyweight champion Juan Francisco Estrada of Mexico is set to fight the Filipino boxer Raymond Tabugon in a 10-round non-title fight on October 8, 2016 in Puerto Peñasco in Mexico. Estrada vacated his WBO and WBA title and moved up to superflyweight division but not officially. Estrada with the record of 33 wins including 24 big victories by way of KO is a 26 years old 2 division world champion. He is a tested boxer and fought some great fighters including, Brian Viloria, Roman Gonzalez, Milan Melindo, Giovani Segura and more. Estrada is a hardhitting and very skilled boxer. In his last fight, he defeated his fellow Mexican Hernan Marquez via KO in a WBA and WBO world flyweight championship. On the other hand, Filipino Raymond Tabugon is a 25 years old boxer with the record of 18W(8KO)-5L. Tabugon is from Gingoog City, Misamis Oriental but currently residing in General Santos City, Cotabato del Sur, Philippines. Tabugon is not new in big fight, he fought some great fighters like Juan Hernandez Navarrete and Makazole Tete but lost.